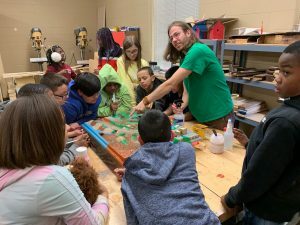 The Protect Wisconsin Waterways team visited the 4th-7th graders at Fruzen Intermediate School in Beloit. Our representatives gave a presentation highlighting the key aspects Protect Wisconsin Waterways focuses on, while educating the kids on safer waterway practices. Throughout the presentation, we asked the kids questions that they all seemed to really enjoy answering, as every student raised their hand at least once. After the powerpoint presentation, we gave the enviroscape demonstration. This went very well, even though some of the students had seen a similar demonstration before. It is enlightening to know that the youth is being educated by not only our organization, but other groups as well. On Wednesday, four of our Protect Wisconsin Waterways team members went to Fruzen Intermediate in Beloit. We hosted a game of Jeopardy featuring water related questions. The kids won Protect Wisconsin Waterways stickers for answering a question correctly and the winning team overall received mini Splash stress balls. The questions ranged from “What is the longest river in the state of Wisconsin?” to “What is the infamous body of water in the video game Fortnite?”. The kids were engaged and excited to answer the questions. 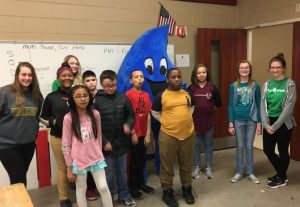 For Final Jeopardy, we asked “ What is the mascot of Protect Wisconsin Waterways, that we talked about last time?” and as the kids answered, Splash made an appearance. The kids crowded around to take a picture with Splash and got to draw pictures of him to finish out the evening.